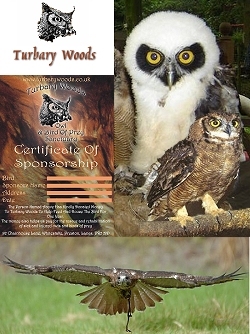 You can contribute to the running of Turbary Woods Owl and Bird of Prey Sanctuary, Lancashire, by sponsoring one of our birds. All monies raised goes to feeding and upkeep of the particular bird for a year. It also assists in the veterinary and feeding bills of the sick and injured birds we rescue each year. For this you get a personal certificate from us, your name on a plaque on our sponsors wall and your name on our website. Sponsors Name: "In memory of Mum love Alison"